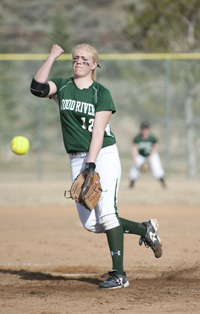 Junior pitcher Brittney Bradley (6-3) picked up three wins to move higher on the all-time Wood River High School softball list for career pitching wins last weekend at Kimberly. But the Wolverine hitting was the high point of its four-game sweep during the annual early-season tournament matching 4A/3A teams from south-central and eastern Idaho last Friday and Saturday. Wood River, Buhl and Kimberly, all Fourth District softball powers, each went 4-0 during the two-day, seven-team tournament. Wood River out-scored opponents 51-8 with a 44-hit attack, Buhl was 57-7 better than its foes and Kimberly had a 42-11 edge in scoring runs. Hailey’s girls downed Shelley 15-1, beat South Fremont of St. Anthony 11-3, whipped American Falls 12-1 and run-ruled Teton of Driggs 13-3. Wood River improved its road record to 7-3 and its scoring average to 9.2 runs per game. Ashley Hicks (7-for-13, .538, 2 doubles, 2 triples, 4 SB, 10 runs); Cassidy Cooper (7-for-11, .636, 6 RBI); Ciceley Peavey (5-for-9, .555, 4 RBI); Alysha Herich (7-for-13, .538, 8 runs, 9 RBI); Blair Radford (4-for-10, .400, 7 runs, 7 RBI); Bradley (.333, 5 RBI); Lacy Harrington (.333); and Shelby Cooper (.272, 2 doubles, 6 runs, 3 RBI). Hicks, Shelby Cooper, Samantha Sutton, Radford and Molly Whittington all made great plays as Wood River committed only seven errors in its four games at Kimberly. Bradley (10 innings, 9 hits, 3 earned runs, 16 K) won the first three games. She was relieved in the first three games by freshman Blair Radford (12 innings, 5 hits, 3 earned runs, 14 K, 0 BB) who won the fourth and final game against Teton. Bradley (22-27 career) moved into a third-place tie on the all-time Wood River pitching victory list with Debbie Rubel (22-10). Next up is Aubrey Kirtley (23-9). All-time record holder is Samantha Engel (38-32). And the early-season start has been a nice change for Bradley, who started 1-6 as a freshman en route to a 7-12 record, and 0-8 as a sophomore before ending 9-12 last spring. Wood River (9-4, 3-3 league) hosts Jerome for an important home Great Basin Conference doubleheader Friday, April 18 at 3:30 p.m. at South Valley Sports Complex softball field. The third game of the GBC series is Saturday, April 19 at 12 noon at Jerome. Wood River High School senior righthander Finn Isaacson threw a five-hitter over six innings lifting the Wolverines over the Canyon Ridge Riverhawks 8-1 in Thursday’s second game of a Great Basin Conference twinbill in Hailey. Coach Donnie Green’s Wolverines (6-7, 3-6 league) used Isaacson’s gem and a 14-hit attack to capture two out of three games and win the season series with Canyon Ridge. Wood River won 2-1 at Twin Falls Wednesday, and then dropped an 8-5 decision in Thursday’s first game on the Founders Field diamond. Isaacson (1 BB, 1 HBP, 8 K) yielded only a leadoff homer by Chris Chapman in the sixth inning before Cameron Benson relieved him in the seventh and nailed down the victory. At the plate, Wood River scored in five of six at-bats with each starter notching at least one hit. Top hitters were sophomore Adrian Rojas (3 hits, double, 2 RBI), freshman Owen Gifford (2 hits, 2 runs), junior Benson (2 hits, RBI triple, 2 runs) and Isaacson (2 walks, 2 runs). Chipping in one hit apiece for the winners were Reide Whitehead, Dylan Broman, Armando Gomez, Cade Schott and Tyler Price. The ‘Hawks got a dominant complete-game pitching effort by Gaige Kepner (117 pitches, 10 hits, 3 BB, 11 K) in its 8-5 first-game win. Kepner whiffed seven of the first 10 batters he faced but started falling behind in the counts in the sixth and Wood River, trailing 8-1, scored four runs in the seventh. Schott started the late rally with a one-out double and Gifford and Whitehead added RBI doubles. Sending 10 batters to the plate in the final frame, Wood River had the bases loaded, still trailing three runs, when the game ended. Losing pitcher was freshman righthander Schott (83 pitches, 6 earned runs, 13 hits, 1 BB, 3 K), who settled down after yielding six runs in the first two innings. Broman came in from shortstop for two innings of relief, keeping Wood River close with five strikeouts. Wood River hosted Kimberly for a non-league twinbill Tuesday, and entertains Jerome Friday, April 18 for a 4:30 p.m. single game. The Wolverines go to Jerome for two GBC games at 12 noon Saturday.